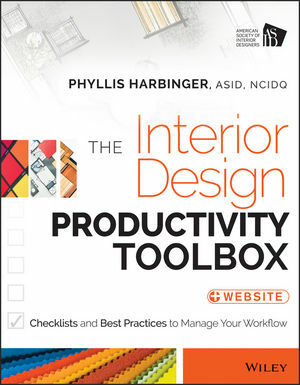 If you need to get organized and get back to work, you need The Interior Design Productivity Toolbox. PHYLLIS HARBINGER, ASID, CID, NCIDQ, is principal and owner of Design Concepts/Interiors, LLC, an award-winning design firm that has served clients globally for over 20 years and an adjunct assistant professor at the Fashion Institute of Technology, where she has inspired students since 1998. She has appeared as both a winning designer and a guest judge on HGTV, and her work has been featured in numerous home and design magazines. In addition to being NCIDQ certified and a New York State Certified Interior Designer, Ms. Harbinger is also a Certified Feng Shui Practitioner, which enables her to integrate Eastern methods and theories of design and balance into her practice. She is a professional member of the American Society of Interior Designers and served as President of the ASID New York Chapter for the 2014-2015 term.